We started this project in summer of 2014.Literacy training programs were conducted near Azeem/lemo gaoth. Around 60 kids were taught. In July 2014, we started evening school for the kids. Initially it was 2 hours, latter after 6 months we increased timings to 4 hours. The address of the school is House L508 Haji Limo Goth Gulshan-e-Gqbal Block 3 Karachi. Currently, we are working to increase income of parents to prevent their kids from doing child labor. Therefore, we are introducing vocational training such as cooking and tailoring for their mothers. We are supporting the education of 200+ underprivileged kids studying at “Jamia Al Mariam School” near Hub Chowki; It is an initiative to revamp the standards of an existing school, their resource mobilization, interaction of parents, management, hygiene and environment, co-curricular activities, mentoring and counseling sessions; all of which is to make education reachable to children who may be less-privileged but have a right to grow in all dimensions. We have set up computer laboratories which will help in opening new doors of information technology for the students of this school. Edvolution Pakistan ascends towards the third step of accomplishing its mission: “Taleemization” by arranging pre-admission training programs for the under privileged but precious children living in the slums of U.P.Morh, Karachi. We are very much thankful to The Grand School for helping us commence our program in their school facility. 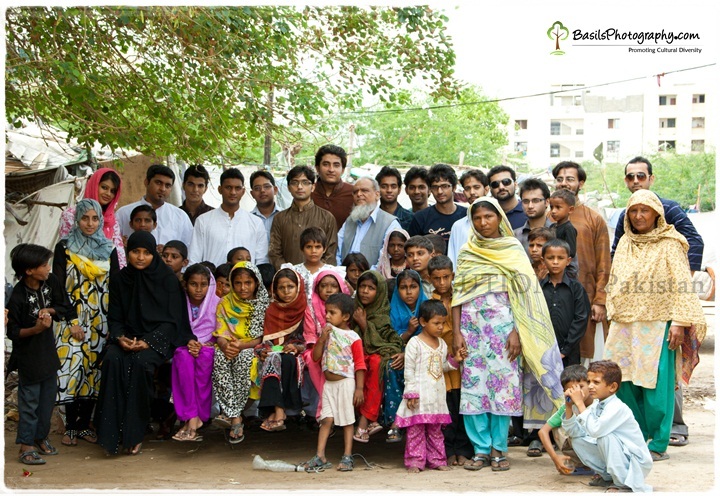 The team surveyed the slums and selected twenty-five children for the pre-admission training program in which they will be given the basic knowledge and education. The team is working hard for the success of the program. After the program, the little minds will be able to take the admission test and get selected to study in the school, thus safeguarding a bright future. 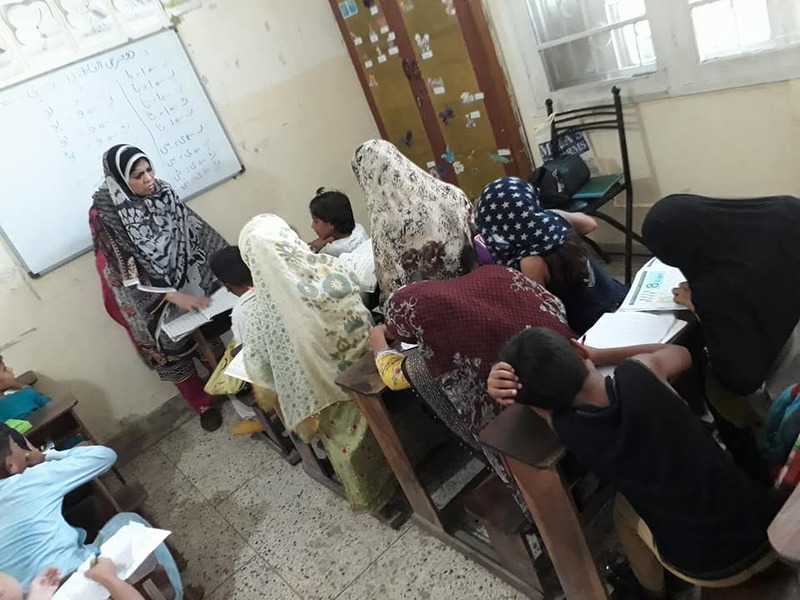 To this date, the first batch of 9 kids selected from the slum area near Al-Mustafa Hospital, Hassan Square are already going to New Cinderella Grammar School (Gulshan-e-Iqbal) and are scoring highest marks in their classes. These kids went through a three month literacy program so that they are prepared for the studies ahead. Weekly tests were taken and the progress was thoroughly observed so that the team could admit the kids to the school. It is important to mention here, that the spending on these children have been through our collections at NED University of Engineering and T echnology, our home ground, for which we are grateful to every single person who contributed and showed trust in us. We admitted the kids on September 2011 and now after one year kids are going to school regularly. After final year of exam, four kids out of nine secured positions in their classes. On 22 October, 2011 we organized a seminar at NEDUET Civil lecture hall. In the event Dean Dr. Shoaib Zaidi rewarded medals to the 9 kids to acknowledge their hard work. This is the story of every poor Pakistani kid. For these poor souls Eid is just another ordinary day when their only thoughts are whether they will be able to get enough food to eat and survive. Our society is divided into two classes, the rich and the poor! While the rich enjoy the pleasures of life the poor suffer. So to bring smiles on these innocent faces, the Eid visit was planned. The kids were overjoyed. They were given treats to eat and henna was applied on the hands of young girls. Cake was served along with other sweets. The smiles on their faces will always be cherished. That was when we realized that real happiness lies in the art of sharing. We did our bit to make these poor children happy and we shall continue to do what little we can contribute. 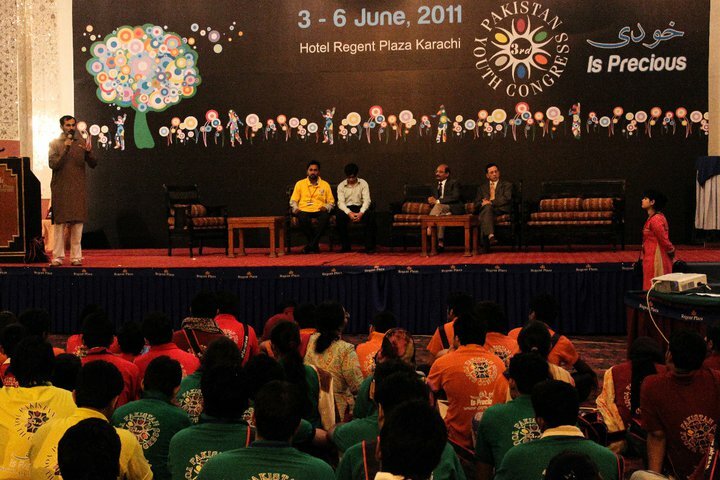 Team Edvolution shared the story and the progress with the people at Hotel Mehran, Karachi in a three hour event “Change the World’ - International Youth Day 2011” held on August 12th 2011 organized by the Department of Youth Affairs, Government of Sindh in collaboration with the Habib University Foundation (H.U.F. ).Four representatives of our team were greeted by the Management. The team Edvolution presented the recent progress of the children that were to be admitted in the school for their education. Mariya Husain, being the speaker of the team held the crowd by sharing the idea and formation of the team Edvolution. The presentation and the success story were the basic elements of the event that provoked the basic idea and also our target. Further discussion on the poor children and poverty became the subject of the event and elaborated on how successfully the team has made the idea possible. The session ended up with a great feedback of the audience with a number of people willing to join the team Edvolution. The team was also given an appreciation award by the management to entitle the work we are doing for the nation. Not long ago, one of us envisioned the rainbow. His comrade grew and 27th July, 2011 became possible. A multitude showed up for, what was not a concert but, an enlightenment of the existing bleakness and the benighted future. It was an open-invitation to become a part of ‘Edvolution-Educational Revolution of Pakistan’. The auditorium of NED University of Technology resounded by the wisdom of the visionary Abdul Haq Mohiuddin. He took the audience through the entire journey till the present day. His words were followed by the gut-wrenching skit prepared by the students of NED University of Engineering and Technology, wherein a young girl dies owing to a curable disease but lack of responsiveness. The distinguished speakers, Nazia Ramzan and Talha Iqbal, further stressed on the need to take initiatives and selflessly strive for the petite working hands of this country; to matter in another life. The two hour event came to a close with echoing National Anthem and a greater sense of responsibility. The engineers of tomorrow proved that they can Design, Make and Build this NATION. 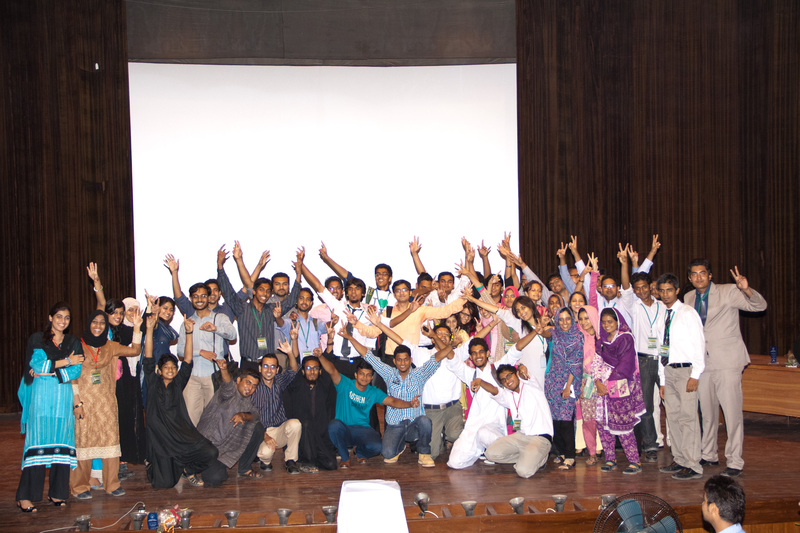 The Institute of Business Management (IoBM) called the team “Edvolution” in their event "IoBM Social Enterprise Enrichment"(I-SEE) - a Social Business Plan Contest held on 6th March 2011 to promote what the youngsters of this generation think about the nation. The event was a three-day program in which the university of Business and Management targeted the strategies and criterion of young people about the recent crises. Students of IoBM with their business minds presented brilliant ideas in the event; their slogan “DO YOU SEE WHAT I SEE” was enthusiastic. The team Edvolution was invited on the last day of event to sum up their efforts. Six representatives of the Team went to promote the idea and to buck up the generation and to prove how powerful “We Together Are”. The success video of Abdul Haq Mohiuddin followed by the thought provoking ideas of the speakers of the team finally ended up with an activity in which the students of IoBM presented their constructive ideas. The activity included the winning idea of Abdul Haq Mohiuddin and that how would they utilize the twenty million rupees had they been the winner of Telenor-Karo mumkin. Together the I-see team and Edvolution on this event were able to make the moments unforgettable. The faculty of IoBM warmly greeted the team and appreciated our efforts and was proud to have called the team to their institute. President Edvolution Welfare Organization was also invited as one of the four panelists in Pakistan Youth Congress to pass a resolution for the improvement of the education system of Pakistan. Abdul Haq Mohiuddin with his members presented his ideas in an indebted manner and received great importance to the ideas he shared. Great celebrities with their great ideas were present. Moreover, the member met other panelists and discussed basic techniques for the further implementation. President of Edvolution Welfare Organization was invited as the expert panelist in panel discussion on “Let`s create a Legacy for Pakistan While we live!”, held at Hotel Marriot, organized by NEWPORTS Institute of Communications and Economics . and motivated the audience on how never to give up. by the audience to which he astutely replied and left them satisfied. To achieve success in different realms of life, along with hard work, motivation plays a key role. 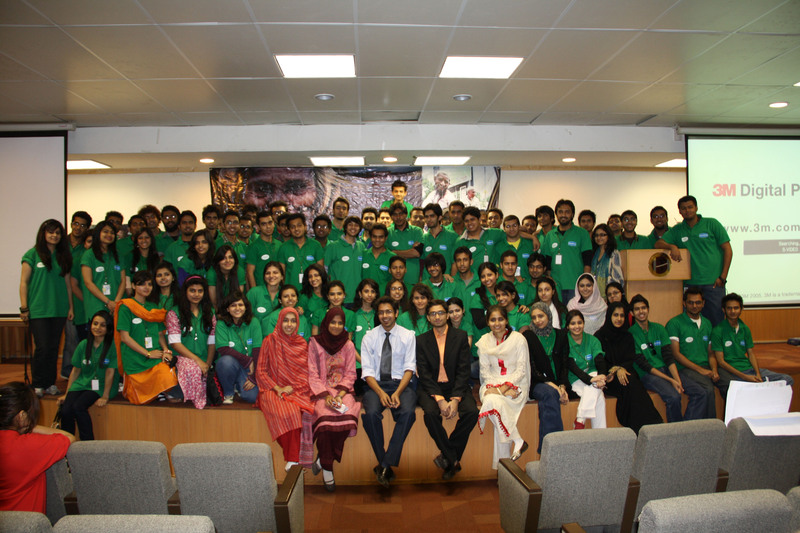 To ensure that the motivational factor remains engraved in the youth who thrive hard to achieve their goals, Edvolution Pakistan arranged a motivational seminar on October 22, 2012 at NEDUET. Eminent motivational speakers, Umair Jaliawala and Talha Iqbal were also invited to “turn the motivation on”. words for our cause was also shared by Dr, Shoaib Zaidi (Dean ECE, NEDUET). vowed to help the poor by spreading education.